Creates a transition from one text to another one by replacing the first text letter by letter with quickly changing random letters that finally become the second text. This iExpression is applied to the source text property of a text layer. Create for each text a keyframe and the iExpression computes automatically the transition between the keyframes. If some text should remain unchanged for some time, simply create two keyframes with the same text at the beginning and end of this region. How many letters are replaced by random letters in parallel. 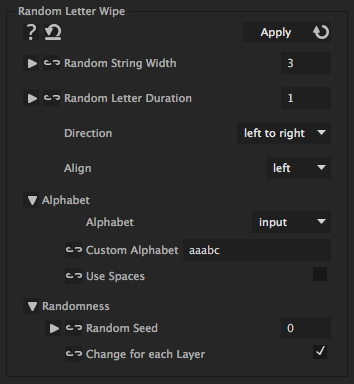 For how many frames each single random letter stays until it is replaced by a new one.